The Film and Media Studies facilities are located in Summerfield Hall and right in the center of campus with easy access to parking and the KU bus system. Several departments share the building, two of which are the University Career Center and Undergraduate Advising Center. Our facilities reside on the 1st, 2nd and 4th floors and provide over 14,000 sq/ft of production and studio space. 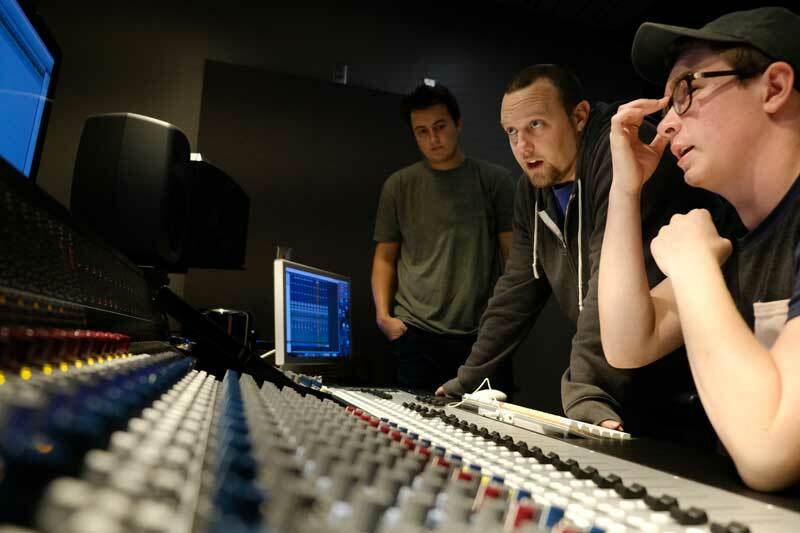 Students have access to a state of the art sound recording studio, soundstage, animation studio, computer lab, and production classroom. Students and Faculty that need to book the recording studio or soundstage can do so by filling out this form. Film Minors do not have reservation privileges. Requests need to be made at least 48 hours in advance of a scheduled production date. Once received you will be contacted for verification. If you are scheduling for multiple days you must fill out the form for each day you plan to be working in the space. In order to qualify for scheduling privileges you must read and agree to the Film Facilities Code of Conduct followed by a short test. You must correctly answer 8 or more questions or you will be notified to retake. The soundstage is made up of over 2700 sq/ft of production space and provides ample room for multiple student productions. 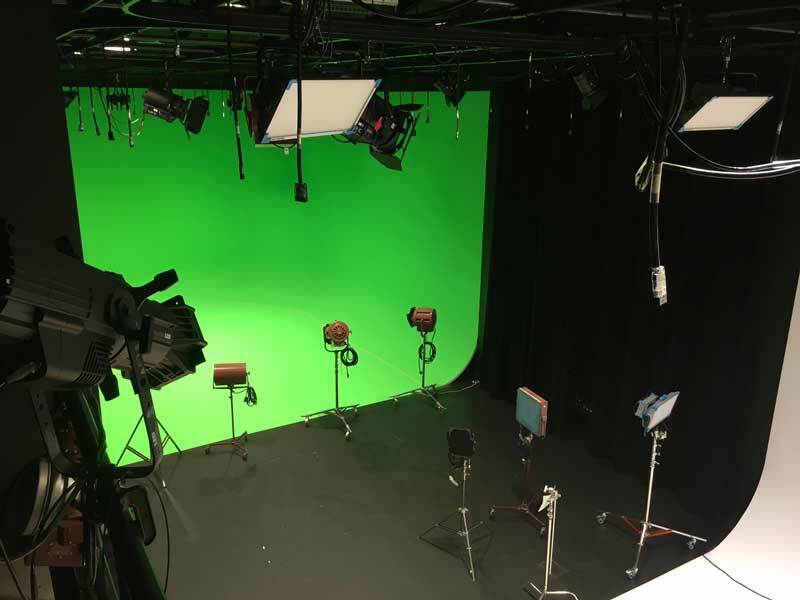 It is outfitted with two twenty-foot cycloramas that provide students with space for green screen process cinematography and infinite space. Our pipe grid is outfitted with LED lighting as well as traditional tungsten instruments with 3000 amp service. In addition, two company switches supply an additional 200 amps each for tie ins. A large double door provides exterior access and allows for the load in of vehicles for green screen work as well as large set pieces. A track system with full length curtains controls light and acoustics. A full array of floor lighting and grip equipment skirts the stage and is available for any scheduled student production. The recording studio not only provides the department a premier space for recording and mixing audio but also serves as a classroom. The same acoustic treatment, floating floor work, double-walled construction that outfits the recording studio is also found in the mixing room. This makes the room acoustically isolated from any sounds or noise transmissions from existing structures and external rooms, an ideal workspace for monitoring the perfect mix. In addition, the control room is equipped with the latest ProTools hardware, industry leading audio console, and supplemental compressors and power conditioners, providing an impeccably clean signal for the ultimate recording session. The recording studio is outfitted with a full range of microphones for four piece classical performances, overdubbing, and foley. Great attention to external noise suppression has been carefully tuned with thermostat control to adjust the HVAC system when a low noise floor is needed. 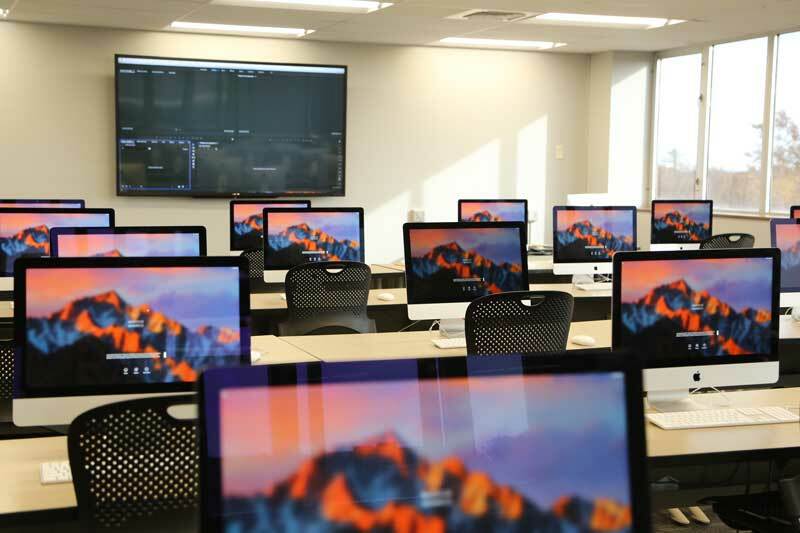 The lab is made up of twenty machines running the Adobe CC suite, Toon Boom Studio for animation, Unity for video game creation and Final Draft; industry leading screenwriting software. Situated on the fourth floor, students have a stunning view of Allen Fieldhouse and central campus as well as the surrounding community. When not in use by classes, students have full access to work on projects in an open lab setting. Adjacent to the lab is a meeting room for script readings, auditions, and group brainstorming sessions. The production classroom was designed to mirror the functionality of the soundstage. Heavy black curtains cover the windows, adjusting not only the light that enters the space but also aiding in acoustic adjustment. A small grid is available for lighting instruments and lighting control is duplicated in both spaces for training consistency. Adequate room is available for the construction of small sets during scheduled productions.